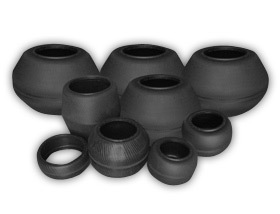 Tyre Curing Bladder is the latest Product from Rubber King group, the quality is contagious at Rubber King and the product has caught the eyes of industry and Rubber King started supply of Tyre Curing Bladders to Indian Tyre companies. Specially designed thermal conductive compounds for Bias and Radial Applications are being mixed in highly efficient mixers with variable speed to achieve the desired dispersion for this high performance product, Specially designed Filtering process ensures no failure of Bladders due to Foreign material contamination. Specifically designed Power pack to the curing Presses ensures uniform profile of cured bladders for consistent bladder life, smooth buffing and special surface coatings on request makes sure the best of Bladder life. Looking to sensitivity of product the whole process is administered under close watch of experienced and trained people.